How do I Fix a Cooking Pot with a Burned & Warped Bottom? It's happened to almost everyone. You place a stove on a burner, fill it with what you hope will be dinner and then walk away, only to discover hours later that your dinner has burned to a crisp, and so has your pot. If it's been on long enough, you might have warped the bottom of the pot, too. But don't worry: You don't have to throw away your favorite cooking pot, but you will need a little elbow grease to save it. A burned and warped cooking pot might be saved with a little elbow grease. Scrape all of the food out of the bottom of the pan. Try to scrape as much of the burnt parts off the bottom out as well. Sprinkle a cup of baking soda over the burned inside of the pan. Pour about a quart of white vinegar into the pot on top of the baking soda. Allow this mixture to sit for at least an hour. Allow up to six hours if you can. Pour the vinegar and baking soda solution out, and scrape the loosened burnt bits up. Rinse with hot water. If burnt pieces remain stuck to the pan after scraping, soak in vinegar and baking soda again. Scrub off whatever black remains on the bottom of the pan with steel wool and regular soap. Check the pot with a level to see the amount of warping that has occurred. If the pot is minorly warped but sits fairly evenly, you may be able to use it as is, at least for boiling water and less intensive cooking projects. If your pot is not severely warped and it's not cast iron, you may be able to bang it back into place by whacking it a few times with a mallet. This will be easier if you heat the pan first. Some cooks recommend placing a board over the pot and hammering the board to avoid further misshaping the pot. If the pot is severely warped, consult a welder to determine if it can be fixed. If you have welding experience, you might be able to weld a piece in place beneath the pan to level out the pot. A warped pot that appears to sit evenly still might heat unevenly if the surface does not make steady contact with the burner. 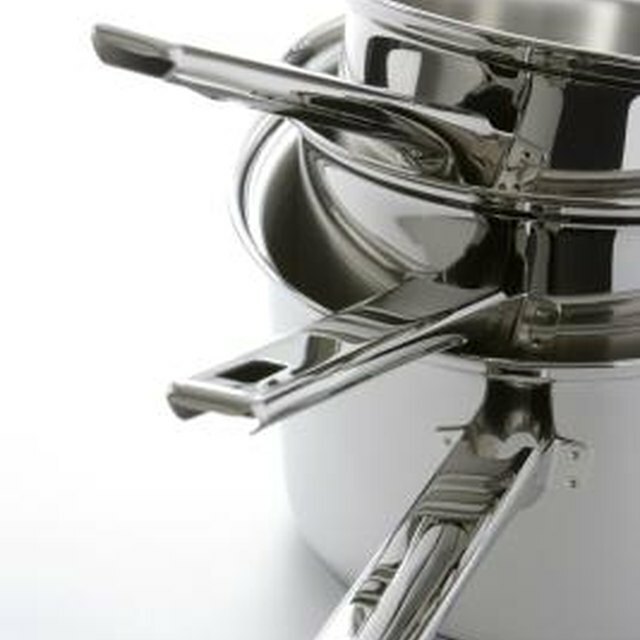 What Is a Non-Reactive Cooking Pot?